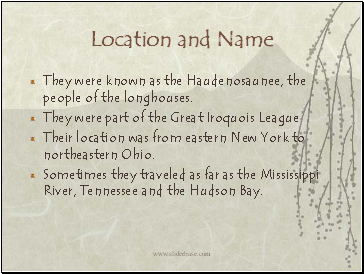 They were known as the Haudenosaunee, the people of the longhouses. Their location was from eastern New York to northeastern Ohio. Sometimes they traveled as far as the Mississippi River, Tennessee and the Hudson Bay. They lived in a village surrounded by a stockade. 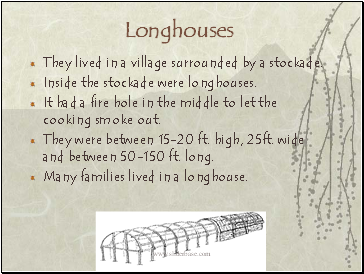 Inside the stockade were longhouses. It had a fire hole in the middle to let the cooking smoke out. They were between 15-20 ft. high, 25ft. wide and between 50-150 ft. long. 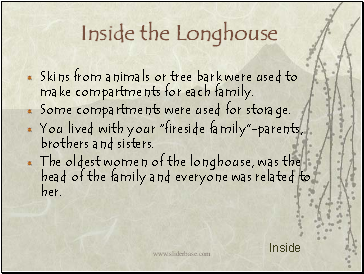 Many families lived in a longhouse. Skins from animals or tree bark were used to make compartments for each family. Some compartments were used for storage. You lived with your “fireside family”-parents, brothers and sisters. 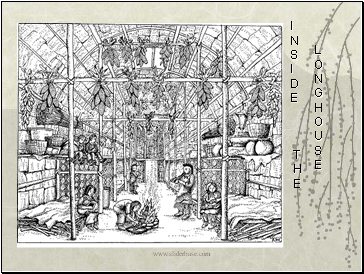 The oldest women of the longhouse, was the head of the family and everyone was related to her. 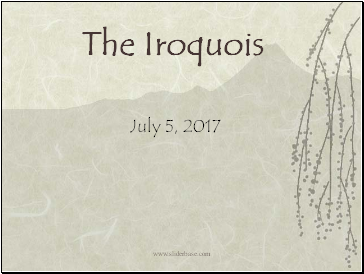 Everyone wore moccasins, made of one piece of deerskin. The moccasin was sewn at the heel and the top for comfort. 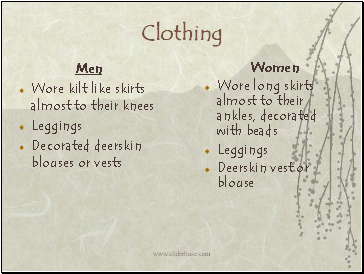 They were comfortable and were sewn with sinew (thread) from the deer. During the winter they wore special shoes known as snowshoes. 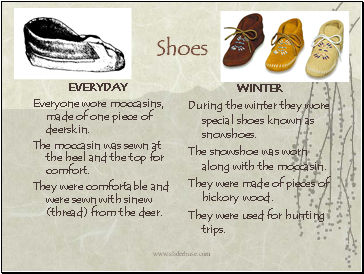 The snowshoe was worn along with the moccasin. They were made of pieces of hickory wood. They were used for hunting trips. Food was attained by farming and hunting. They ate a lot of vegetables, fruits, nuts and different kinds of meat and fish. 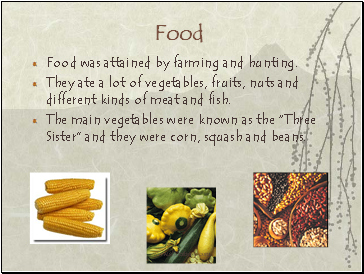 The main vegetables were known as the “Three Sister” and they were corn, squash and beans.